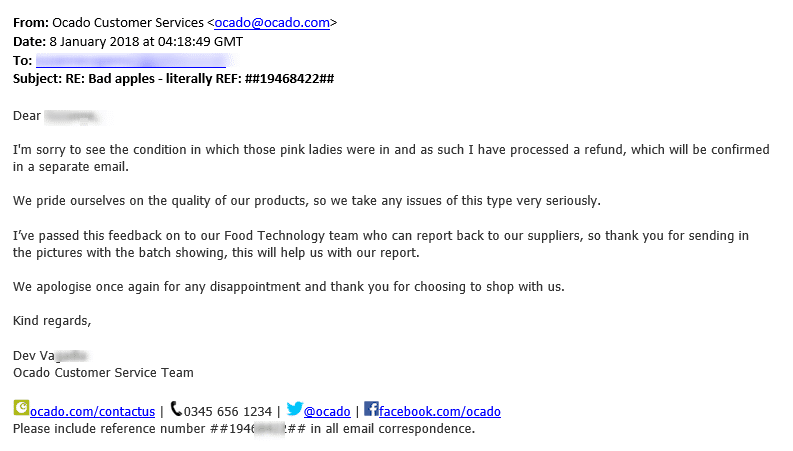 This post is inspired by Ocado’s excellent complaints handling process. Ocado is one of the world’s most technologically-advanced grocery services, using robotics, AI and more to disrupt the market. They set a high standard for customer service here in the UK. They are the world’s largest dedicated online grocery retailer with over 580,000 active customers shopping with them, have over 12,000 employees and they’ve been in business for 16 years. It’s very easy to write about companies who are delivering a great customer service, when they are small and therefore nimble. 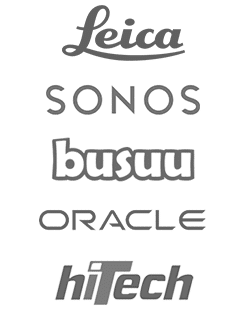 What’s more unusual is having a brilliant, seamless customer experience with a large corporate organization. At Customer Thermometer, we’re passionate about showing our customers how to encourage complaints. Why? Because, if you don’t make your complaints handling process easy, your customers will leave you AND tell others how bad you are. My experience with Ocado over the weekend was a masterclass in how to encourage complaints. We put them in the fridge for the week. Last Sunday, I reached into the fridge to get the unopened pack of apples out. Three of them were rotten – actual bad apples – the source of so many analogies, but these were really bad apples. The remainder were inedible, so in the bin they went. They cost us £2 / $2.70. We could have ignored it and moved on with our evening – it wasn’t a big sum of money, however there’s a principle at stake here. As someone who’s been involved in the world of feedback, I can’t help myself to test out a complaints handling process and see how a company responds. 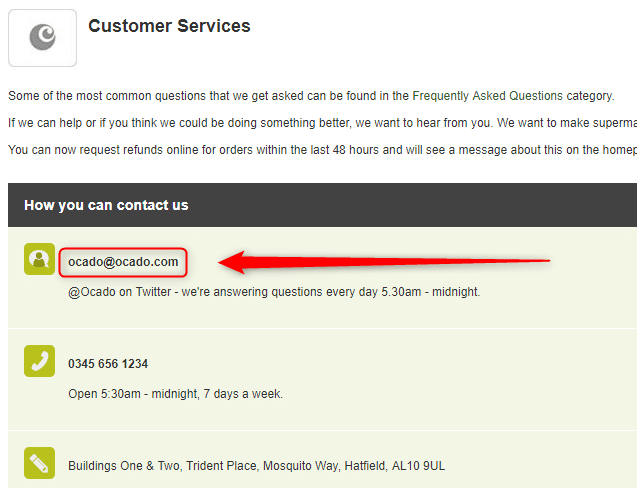 Here’s five things Ocado got absolutely right. There’s one contact us page and it couldn’t be simpler. There’s no web form with dozens of questions, asking for order numbers / dates / inside leg measurements. I sent a quick email, alongside a couple of photos, alongside the order ref. It took a minute or two and I didn’t go searching around for customer number / date of delivery etc. So many companies would demand so much more information. Don’t fall into that trap. Make it easy, keep it simple. You do the work. An automated response came back quickly and I was promised a response within 24 hours. 6 hours later, at 4:18am I got a response. I’ve added their exact response below. For me it’s perfect. It’s written by an actual human who cares. If it does contain canned response elements, you’d never know. There’s an immediate apology and refund statement. They go on to show they actually care and are going to do something with your feedback. They thank us for taking the trouble to write in. It’s signed off by an actual human, as opposed to an anonymous team name. When responding to complaints (providing the customer isn’t clearly being unreasonable), don’t be tricky, don’t quibble. If a customer is unhappy and has taken the trouble to complain (and yes, it takes effort), then treat them right. Don’t don’t ask what the fridge temperature was… don’t put the onus back on the complainant. Ocado – congratulations – you’ve got one very happy customer, who’s taken the trouble to tell the world about his experience. 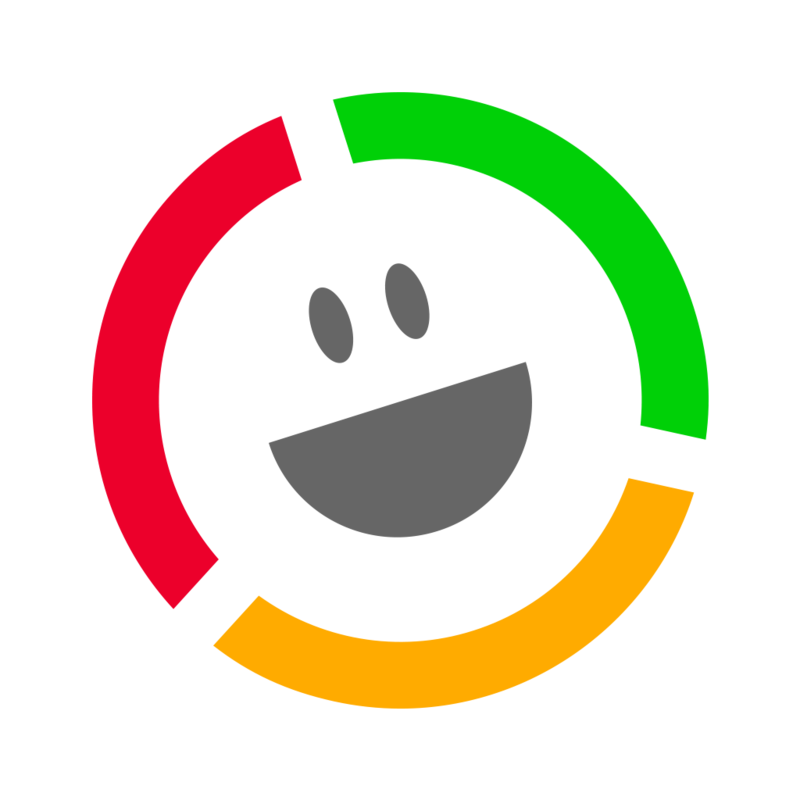 If you would like to give your complaints handling process a boost, why not give Customer Thermometer a try for free?